3D printing has been around a lot longer than most people realize. Presently, 3D printing is celebrating nearly 30 years of manufacturing technology. In the early 1980s, the technology’s roots were set with stereolithography. Fabrication of models was done using photosensitive acrylics or resins that upon treating with UV radiation would solidify. The models could then be built up layer-by-layer, allowing for the quick production of 3D models. These first models weren’t perfect; hardening of the material distorted the models. The new technology was also extremely expensive. As the technology grew, costs were driven down and its use was expanded. Currently, it is possible to 3D print food, specialized shoes, custom figurines, and for the more ambitious (and wealthy) a car. Where 3D printing is truly making waves is in the healthcare industry with the production of prosthetics. Loss of a limb is both physically and psychologically detrimental and reactions to amputations can vary. As patients learn to cope, they may also choose to acquire a prosthetic limb. The difficulty is that each prosthetic is fitted to an individual, each with varying size and level of amputation. There are no standard measurements. Also, some prosthetics can be costly. It’s here where 3D printing is finding a strong niche; databases are cropping up for do-it-yourself printing for affordable prosthetics. Expanding this further, there have been reports of 3D printed titanium jaws. Aside from food, all of the technologies discussed thus far were printed using inorganic or plastic media. In 2013, researchers from Harvard were able to 3D print a bionic ear. This ear was comprised of a cochlear implant embedded within a biological matrix. This feat showcases an alternative route with 3D printing. Tissue engineering has its challenges; cells and other biological tissues are fragile in a lab setting. Unlike a living host, the cell cultures are exposed to the environment and are not protected by an immune system. The cells must also collect nutrients from their surroundings as well as oxygen. In a human, our circulatory system carries nutrients and oxygen to cells. The blood vessels penetrate tissues, called vascularization, and also harbor the body’s immune system. In the lab, the cells are immersed in culture media supplemented with antibiotics; however, contaminated cell cultures do occur, causing cells to die. Another element to consider in 3D bioprinting is overall structural integrity. Some large bioprints may incorporate structural supports like thermosetting plastics. How do you print with cells? After cultivating the cells, they are mixed in a nutrient-rich hydrogel that is viscous enough to keep its form but can flow through a syringe. Once injected, the hydrogel will set into its form. Just like conventional 3D printing, the hydrogel is patterned and layered to build up to a final structure, like an ear. 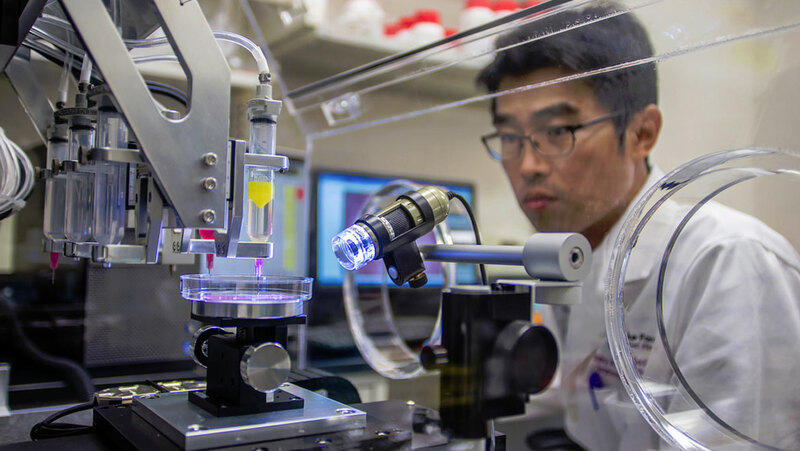 One of the goals for 3D bioprinting of engineered tissues is the development of printed organs. Sadly, there is an ever-increasing need for donated organs. In the US alone, the number of patients waiting at year’s end for transplants has surged to over 120,000 patients and on the rise. Donations have remained constant, never exceeding 20,000. Researchers are devoting a lot of time and effort to generate functional organs that are biocompatible. One success has been the heart on a chip from Harvard University. What is unique about the chip is that the muscle fiber contract and mimic the structure and function of native tissue. The video shows both the fabrication and function of the chip. The chip flexes and extends in response to stimuli. Though laborious and expensive to make, the process to make the chip was automated. The researchers hope to increase the complexity of their devices and have already mimicked the microarchitecture and function of lungs, intestines, and tongues. What can we expect in the future? Like any given technology, the cost of operating it will go down. Researchers will try to find clever and inventive ways to drive down the cost while expanding upon the platform. This may mean affordable bench top unit in hospitals or healthcare facilities that can custom make tissues for patients. This may also expand into partial transplants or organ tissue repair, which will drive down the need for full replacements. Using cells from that originate from the patient, the chance of rejection will drop as well.